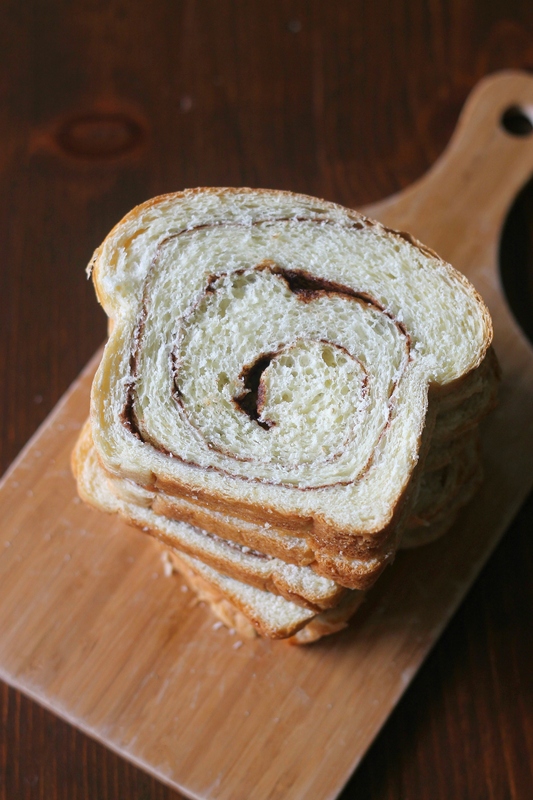 The two of us and cinnamon swirl bread go way back. As we have mentioned before on multiple occasions, our mom didn’t really buy processed treats frequently when we were little. This was one of our few store bought “treats.” Toasted with a little butter, it was always perfect. The past few years neither of us have really loved the store bought kind, though. It does not have a lot of cinnamon flavor so it is rather bland. However, our two youngest brothers are obsessed with it. The two of them can easily go through a loaf in a day. That’s a lot of bread. Since they love it so much, and because we wanted to see if it would be better homemade, we decided to try it. We didn’t have to convince ourselves too much because yeast breads are our favorite things to make. There is something so fun about watching the dough puff up and then getting to work with it. And then, obviously, eating those delicious carbs (which is both a good and bad thing, although probably mostly bad). So, how did this bread turn out? Very well! It did not lack in cinnamon flavor at all and had the perfect amount of sweetness. The bread itself was soft and tender. The dough was a little sticky at first, so we had to add a bit of extra flour. Our littlest brother, Henry, enjoyed playing with the “fluffy” (his words) dough. He punched it down after the first rise! The swirl turned out wonderfully despite a not-floured-enough counter! 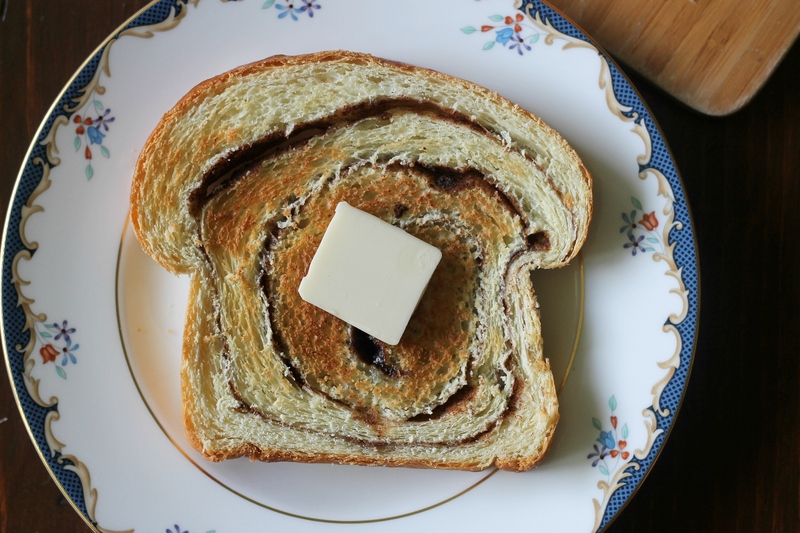 We decided to eat it the same way we did when we were little: toasted with butter. If it isn’t too hot your way this weekend, we highly recommend making some of this bread! In a 2-cup liquid measuring cup, whisk milk, water, eggs, and melted butter together. In the bowl of a stand mixer fitted with a dough hook, combine 3 1/4 cups flour, sugar, yeast, and salt on low speed. Slowly add the milk mixture on low speed and let come together. This will take about 2 minutes. Increase the speed to medium and knead until the dough is smooth and satiny, about 10 minutes. Check after about 4 minutes to see if the dough seems too sticky- if the dough is only sticking to the bottom of the bowl, it is fine. If not, add extra flour 2 tablespoons at a time. We needed to add the full amount. Transfer the dough to a lightly floured counter and knead by hand to form a smooth, round ball, about 15 seconds. Place the dough in a large, greased bowl, cover tightly with greased plastic wrap, and let rise at room temperature until it has doubled in size, about 2-2 1/2 hours. Meanwhile, grease a 9 by 5-inch loaf pan. Combine the sugar and the cinnamon in a small bowl. Transfer the bowl to a lightly floured counter and press into an 18 by 8-inch rectangle. Make sure the short side is facing you. Brush the dough heavily with the milk, leaving a 1/2-inch border at the bottom edge. Sprinkle with the cinnamon sugar. Roll the dough toward you in a tight cylinder, keeping it firm by tucking it under itself. Pinch the seam shut, and place the loaf seam side down into the prepared pan. Cover loosely with greased plastic wrap, and let it rise at room temperature until nearly doubled in size, about 90 minutes. The top of the loaf should rise about 1 inch over the edge of the pan. Meanwhile, preheat the oven to 350 degrees and put the oven rack in the middle position. Brush the egg mixture over the loaf. Bake until the crust is golden brown and the loaf registers 195 degrees, about 30 to 35 minutes. Transfer the pan to a wire rack and let cool for 5 minutes. Remove the loaf from the pan, return to the rack, and let cool to room temperature, about 2 hours, before slicing and serving. The bread can be frozen up to a month if wrapped in plastic wrap and foil. Enjoy! Wow this looks delicious, will definitely be trying this recipe !